In addition to this change, we also have redesigned our website (New York Graphics Customers can search for any available art print with the same item number you used before). We have also added new filters which filter art by category, genre/style, subject, color, size, shape and much, much more. We have also just launched our new custom collection filters to all of our pages. This will allow you to narrow down your results to New York Graphic Society products, Value Line products and Clearance. We have also granted newly designed “Art Project Manager.” Our Art Project Manager will allow you to save multiple prints as well as custom configured framed or canvas art as a group with side marks and comments. 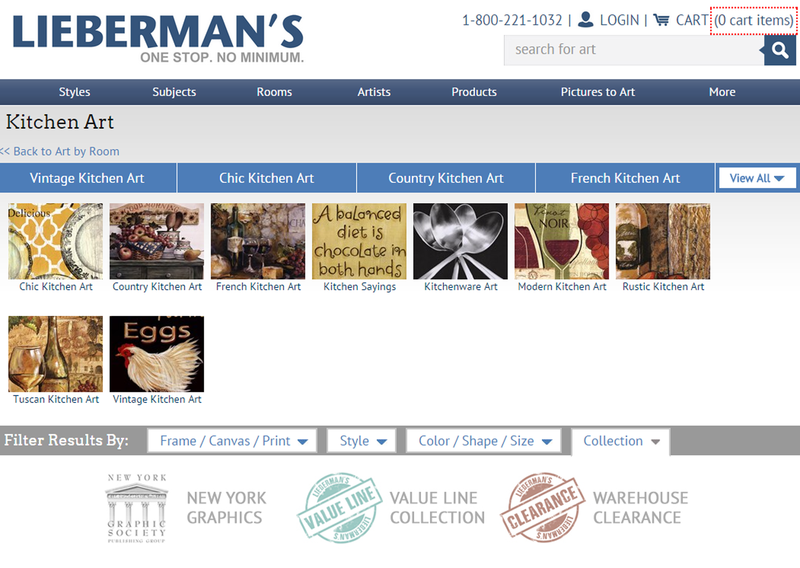 If you have any additional questions or concerns about fulfillment, pricing, online ordering or your account, please feel free to call us directly at 1-800-221-1032 or via email at info@liebermans.net. This entry was posted on September 21, 2015 at 2:32 pm and is filed under Uncategorized. You can follow any responses to this entry through the RSS 2.0 feed. Responses are currently closed, but you can trackback from your own site.